for a long time I enjoyed sharing tales of my son who I called My Boy B, B standing for boy, because someone didn’t want his name to show up in a goobingle search and people hunt him down. Yeah, he was an amazing cute little guy, the kind that strangers would come up to and want to touch or try to take pictures of wherever we went. B is now 14, 5’9″, strong as a bull, and can punch like a truck. And his name is Zach. Please don’t spread that around, especially if you are reading this and know my family. I want to wake up in the morning with all my parts. Zach was fodder for a few posts here on Ronovan Writes, plus a great photo of me with a black-eye after trying to catch a baseball he threw with my eye. The vision still hasn’t cleared from that. I thought I would give an update for those who remember those days and a jumping on point for the new readers. He made the school baseball team and is now over that desire. He just wanted to make a team once so people would leave him alone, plus he loves baseball, but he injured his shoulder so a career is out of the question without surgery and that’s not happening. So what is his focus? The trumpet. Yes, my son is a band geek. But not that movie stereotype. He knows everything about cars, video games, and apparently everything that’s ever been invented ever. Just ask him, he’ll tell you. Why is his main focus the trumpet? He’s in the 8th grade and first chair in the school jazz band. That includes high school students. 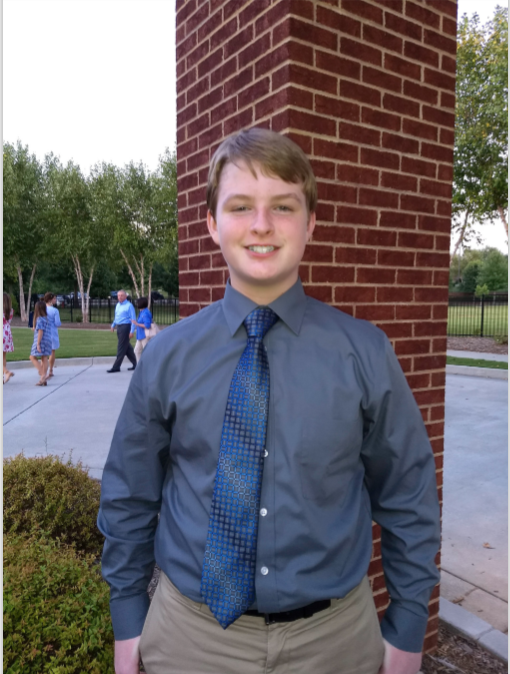 He recently made District Honor Band. The Band Director depends on him as one of the leaders of the band as well. Whenever there is a competition, everyone else is told to pick up an application if they want to participate, but Zach is told to come up and is handed one. He’s still in the gifted Duke Tip Program and scored very well on the SAT which included Math and Verbal without Essay. And is also in the National Junior Honor Society. He just had his very first high school advisory meeting and his advisor loves him. She already looked at his academic and class history and had him down on the Diploma with Distinction College Prep path. If you read my post from yesterday this is him making a decision at his Point B on his Route of Life that deviates from the majority of people his age in this area who will simply go with the flow. She went all fan girl when she learned about his Honor Band concerts over the years and his wanting to be an Engineer. I’m not sure why he wants to drive a train. Maybe too much Thomas when he was a kid. A piece of advice for new parents out there. I am a strong proponent of holding a child back a year at the Pre-K level. When Zach was tested at his school for Kindergarten he scored for First Grade, but his age was actually just a few weeks under the limit to fit in to Kindergarten and not Pre-K. The principal suggested that due to his age that we hold him back. It was a difficult decision but it has worked out so well. Teachers always comment on how he is a calming influence on his classmates and is so mature. Plus, studies show that those who are held back are 30% more likely to end up making it all the way through Graduate School. Now for an idea of what Zach is like. Recently his Math teacher, who is new to the school this year, asked for the answer to a problem. No one raised their hand so as usual in all of the classes Zach was asked to give the answer. She smiled and said he was wrong. They went on with the class and the same type of problem came up toward the end of the teaching portion of class and she smiled and asked Zach to answer. He gave the same answer. She laughed a little and asked why do you think that is the answer. “Because that’s the answer,” he said. At this point a few of his friends were covering their mouths trying to hide their smiles and not to laugh. You see, Zach has reputation with his classmates that his teachers never seem to pick up on. He doesn’t speak unless he knows the answer. And if he continues to give the same answer then he is positive the answer is right. The teacher kept at him about it and she said this is the correct answer and he said okay. She asked him what he meant by okay and he said that she was the teacher and if that is what she wanted the answer to be then that’s what the answer would be. You can imagine she wasn’t pleased. So she asked him why he continued to insist on giving his answer. The truth finally was revealed. He had already completed the homework for the next two days and the answer he gave was checked as correct by the online homework assignment. Zach was identified early on as some kind of Math genius. He could do Math in his head during Kindergarten. One of his teachers, the lead teachers for all of Elementary school suggested he work with a Math expert over the summer to continue to further what he was already doing. But what parent would do that to their little kid? I’m proud of the boy. He’s made a decision, chosen a path, and is set to do whatever it takes to achieve his goals. One of which is to get a music scholarship and play in the University of Georgia Redcoat Marching Band, and while getting his music degree he will double major in engineering and get that degree in a fifth year that’s not covered by that music scholarship. Yep, the boy has it all planned out. Nerd. For all of my blog family, meet 14 year-old Zach. Everyone says he looks like me, just without the red hair of mine. I think they are just being nice to me. We are a pitiful lot, aren’t we? We look around and see things we want. We want that car he has, or the job she has, and don’t forget the hair she has, but then you can buy that. That’s just the beginning of the wants. Can you imagine if there were a true Want Ads section of a newspaper? I am about to do something that will help make me a successful and happy man. This something that a small percentage of humanity will do in order to reach that pinnacle of life. I am going to begin a journey. This isn’t a journey to Disney World or the Grand Canyon, although for some, that may be the journey chosen. No, this journey, this Route of Life starts at my current existence and choosing my chosen point of happiness and success, making decisions along the way to make it all come true, before parking my Ferrari Portofino at the final Exit of Life. You are thinking that we all do this every day of our lives. That’s not true. You see, we all have this GPS of Life we start out with at birth. Point A is the day we are born. Point B is when we should start making decisions about our future, and Point C is the end. Point A you can’t control, you’re strapped in your car seat in the self-driving car that carries you through life and head to Point B. Most of us, when we turn 14 or so, the Age of Decision Making, move from the back seat to the passenger seat for a better view, just so we can see things we want. You are delivered to your high school advisor and she asks what classes you want to take, what school sports or activities you want to be in, and what are your plans for after graduation. You push the well-worn button number one, then as the window of your car rises, you fall in line behind your best friend and the other lemmings. You enter Point C, the Exit of Life, into the GPS of Life with adequate restrooms available along the way and the trip continues. The car of your life drives along and when obstacles appear, it picks the easiest way around that obstacle and continues along the way with no side trips or new point C in your trip. All easy and simple. You graduate high school. Sadly for you, your best friend is accepted to a college out of state because she made decisions you didn’t know about. You enter the college nearest to home. While you get your Business or Education degree you meet someone, because that is the GPS of Life’s most used route from your point B. You stare wide-eyed like a deer caught in blue tinted halogen headlights as you walk down the aisle because you are supposed to do that after you graduate college, even though you aren’t certain that you even have feelings of like, let alone love, for your future spouse. Now you are at least happy your high school advisor suggested you enter the “adequate restrooms” into the GPS of Life, because if you are a man, you have married a woman, who at one time drank five margaritas and three shots of something that was never identified and danced for three hours without stopping, whose bladder has now suddenly become the size of a raisin or if you are a woman, you need to get warm because your husband doesn’t understand that normal humans need to use heaters during winter, not air conditioners, which means you need coffee every 30 minutes, and of course that means you need to pee, and the cycle continues. And let us not mention what happens once the children come along. And the dog. The incontinent dog that your wife just won’t allow you to put to sleep although it can’t walk or even poop without you helping it stand, and you sometimes have need to poke the poor thing to start its breathing again. Try to look cool in that grassy area at the convenience store holding up the back end of a Boxer so it can poop. That’s the Success Life of Happiness. I think you probably see what the GPS of Life is all about. You are simply a passenger that makes the stops and visits the places between points B and C that are most common for people in your general area and demographic, which your high school advisor helpfully programmed in for you at Point B, the Age of Decision Making. That describes a very large percentage of the world. For some, they can’t get off that GPS of Life route. They are born in to a world where there are very few stops between Point A and Point C, and there is no Age of Decision Making. But for people that are reading this, very likely you can reroute. And thank God, Oprah or BTS for that. For me, a journey is a series of decisions you make. The first decision is often the hardest decision to make but it is the one that frees you. It could be you quitting a job to start your own business while you have no guarantee of success or income for the next month or six. It could be moving thousands of miles away from everyone and everything you know. It could be a change of your current family life package. One piece of advice at this point, an aside if you will, tell your doctor about your beginning a journey, because it is very likely your blood pressure will be rising at first due to stress, unless your rerouting is a fabulous opportunity with nothing to leave behind. For the rest of us, read me, you don’t want to get misdiagnosed and end up doing a nuclear stress test. People that can sit down, analyze their life and then say they are truly happy are those who have taken journeys and achieved success. You need to define what your success will be. For me, that journey is beginning late in life. But, is it ever too late to become happy? Is a person ever too old or too far along the GPS of Life route to swerve in to that next exit, take a deep breathe, and reroute? By this time next year, I should be at a Point C in life, that new Starting/Current Life point working on a Point D, Success and Happiness. No one make any assumptions about what that C is. I am an odd one and it could be anything. I am the amnesiac who wrote an historical fiction novel about pirates and met a blogging friend from Australia, who was born in Malaysia to Chinese parents, at a Cracker Barrel in Georgia for breakfast and introduced her to grits for the first time in her life. In my life, anything can happen. And I want anything to happen. I am going to have fun until that Point E, the Exit of Life, comes along. Bring it on world, I got your GPS right here.